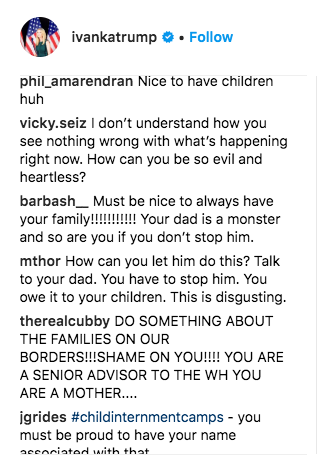 People shocked by Trump's immigration policies are now also shocked at the "callous" social media updates from the president's family and friends. As Trump and his administration's policies separating migrant children from parents continue to instill horror among families at the border and US citizens at large, some of those closest to the president are seemingly staying mum on the issue. In fact, not only are some of Trump's associates not saying much at all on the controversial "zero tolerance" policy — what they are saying and sharing publicly is being called tone-deaf by many Americans. Here's what some of them have been sharing on social media amid news that more than 2,300 children have been forcibly taken from their parents at the US–Mexico border, with no plan for reuniting them. On Friday, Ivanka Trump tweeted her concern about children's health. The lack of affordable, accessible #Childcare is still the biggest obstacle that stops women from fully participating in the workforce. We fought hard for (and won!) the largest EVER expansion of the Child Care and Development Block Grants in the omnibus. As of Wednesday, neither Ivanka or Jared Kushner have made any public comments about their father/father-in-law's zero tolerance policy. Her tweet drew more responses than retweets, which we Twitter users call "getting ratioed." "If you're supposed to be such an advocate for children and women, why aren't you saying anything to dear old dad about what he's doing to poor, immigrant families, by separating them from their children?" one user responded. 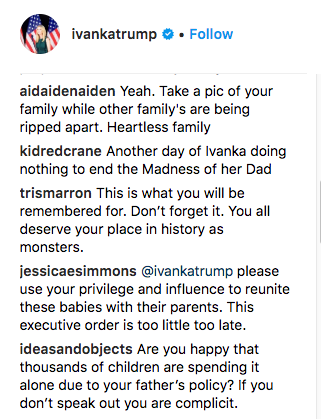 @IvankaTrump If you're supposed to be such an advocate for children and women, why aren't you saying anything to dear old dad about what he's doing to poor, immigrant families, by separating them from their children? For Father's Day on Sunday, she also shared a photo of her (intact) family. Melania Trump, who said she “hates" to see what's happening at our border, tweeted a thank you to the US government for all that they "do to protect our children." On Tuesday, she also shared a photo of the Spanish royals' visit to the White House, and said she and the queen had talked about "ways [they] could positively impact children." On Tuesday night, Sean Spicer, the former press secretary, shared a photo himself living it up at Trump's DC hotel where people were enjoying a massive bottle of expensive champagne. He captioned it, "If you are having champagne @trumphotels make sure you have enough for everyone." People were offended by his decision to post the image on the same night the Associated Press revealed babies have been taken from their migrant mothers. On Wednesday, Spicer hit back at critics. On Tuesday evening, before Secretary of Homeland Security Kirstjen Nielsen tweeted about working on a bill that would supposedly "keep families together and secures the border," she went to dine at a Mexican restaurant in DC. Thank you @housegop for meeting with @POTUS and administration officials this evening - now is the time to pass a bill that closes dangerous immigration loopholes, keeps families together and secures the border. Protesters confronted Nielsen at the restaurant and shouted, "If kids don’t eat in peace, you don’t eat in peace" and “shame” — forcing the secretary to leave the restaurant. DHS Secretary Nielsen just got driven out of a Mexican restaurant here on 14th Street by activists. DSA, I believe. On Wednesday, as the Trump administration continued to detain asylum-seekers, Secretary of State Mike Pompeo commemorated World Refugee Day by releasing a statement that read that the US will "continue to help the world's most vulnerable refugees, reflecting the deeply held values of the American people." Which was perhaps too ironic for some. Donald Trump Jr., who's been unwavering in his support for his dad's policy, also commemorated Father's Day by posting a photo of him and his kids. The next day, ProPublica published audio of a desperate child in a holding facility crying out for her "Papi." The other Trump son, Eric, has been tweeting serene photos of his travels. "Nice view!" someone commented. "What about the kids in cages tho?" @EricTrump @LGAairport Nice view! What about the kids in cages tho? And finally, Vanessa Trump, who filed for divorce from Trump Jr. earlier this year, tweeted photos Wednesday about a trip she's taking with her "kiddies before their summer camps start!" Her tweet came after Trump supporter Laura Ingraham on Fox News compared the migrant holding facilities to "summer camps." @MrsVanessaTrump Y’all are so unbelievably tone deaf it’s unreal. She promptly deleted the tweet after it received this devastating ratio.